“Apollo 13: Houston, We’ve Had a Problem” is an interesting documentary about the Apollo 13 Mission in 1970, pieced together by Robert Garofolo in 2004; Joanne (his wife) is an associate producer, for Classic Films. Even compared to the PBS documentary from 1994 (Oct. 9, 2014) as well as Ron Howard’s 1994 film, this work comprises mostly actual footage from inside the modules, as much as possible, as well as footage of the men working in short-sleeve shirts but with neckties at the Houston Johnson Space Center. There is ample footage of the gray lunar surface from the module as it makes one orbit around the Moon to get the slingshot back home. The 88-minute film then uses as much if the actual vocal footage as possible, too. The men do not seem panicked, and the situation does not seem as dire as in the Howard movie. One critical step in liftoff occurred a minute too soon, and when the explosion occurred, they at first did not know what had happened. There is some Chemistry 101 in the script, discussion of “partial pressures of carbon dioxide” and of what lithium hydroxide does. The DVD contains a speech by Jim Lovell, Commander of Apollo 13, “The Odyssey of Apollo 13”. The film should not be confused with a TV film by this name from 1974 directed by Lawrence Doheny, which, with actors, tells the story of the controllers on the ground in Houston. 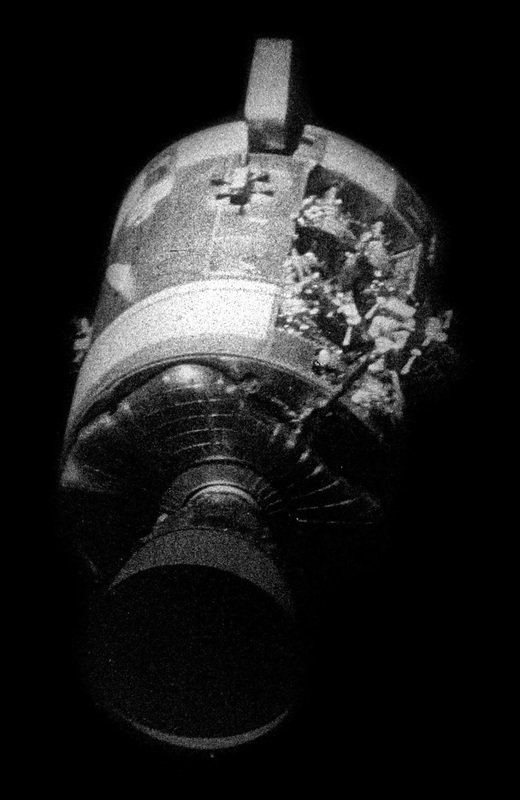 Wikipedia attribution link for Apollo 13 service module after jettison. The DVD is available from Netflix, but tends to have a waiting list.